English has become the global academic lingua franca. In recent years English-medium Instruction (EMI) programs have rapidly developed at universities where English is a foreign language. The need for Faculty Development (FD) for the success of EMI programs has most recently begun to be recognized. This paper briefly reviews FD for EMI, then reports on an actual Global FD program in Japan, with more than two years of complete data on individual faculty consultations. The university aimed to encourage regular faculty members to teach in English, but their expressed needs revealed broader international academic concerns. The need for global faculty development (hereinafter FD) arose mainly from the provision of courses with English-medium Instruction (hereinafter EMI), which in turn constituted a response to globalization by universities in many countries where English is a foreign language. As with training in new educational technologies, FD for globalization tends to arise after the implementation of EMI, if at all. A case in point is presented empirically in this paper, but the FD documented and discussed will go well beyond the context of EMI to the support of global academic needs. The medium of instruction is an important educational policy issue, which can be controversial where different native languages are involved. Between non-native English users from different countries, English as a lingua franca (ELF) commonly serves as a compromise solution, a bridge language that does not disadvantage either side in communication. The situation of EMI in higher education could similarly be attributed to English having become the global academic lingua franca. For a specialized analysis of the role of ELF in EMI, see Jenkins (2018). Macaro, Curle, Pun, An, & Dearden, reviewing 83 studies of EMI programs in various world regions, "conclude that key stakeholders have serious concerns regarding the introduction and implementation of EMI despite sometimes recognising its inevitability" (2018, p. 36). If the goal is to improve English proficiency, Macaro et al. find the published evidence inconclusive or not rigorous enough methodologically. Doiz, Lasagabaster, & Sierra, who researched EMI programs in much of the world, report that instructors who are non-native English users may focus on content and neglect linguistic accuracy, while students may have insufficient English proficiency for the EMI program to succeed. Moreover, Doiz et al. could not find even one program they would regard as FD for EMI at any university they investigated (2013, pp. 216-219). Brown (2015) conducted a survey on EMI programs at 258 universities in Japan for his doctoral research, and found that, with government support, nearly one-third of universities offered some form of undergraduate EMI. Most programs were small scale, serving domestic students, in the humanities and social sciences. The relatively low English level of students for EMI was a major concern, yet there was little sign of language proficiency benchmarks for entering EMI courses, coordination with English language classes, or training (FD) for the key stakeholders, that is, domestic faculty members teaching most of the EMI classes. Brown concludes that EMI programs are expanding, but exemplary practices and more effective ways are needed to "recruit, evaluate, incentivize and train faculty members involved in EMI programs" (2015, pp. 54-55). Similarly, Horie reports that regular university faculty members in Japan lack support for EMI classes. Beyond improving their English language proficiency, they need to develop suitable pedagogical skills to facilitate multicultural classroom interactions (2017). See Brown's dissertation (2015) for more details, but the points introduced above will be of particular reference when considering how innovative the programs in the following sections might be. Spurring this trend, the Japanese government has sought to greatly increase foreign students in Japan, and promotes EMI programs in order to lower the language barrier to entry. Selected universities started EMI programs by 2014 with large grants from the Top Global University project of the Ministry of Education, Culture, Sports, Science and Technology (MEXT). The Ministry aimed to both attract foreign students and to raise the global rankings of Japanese universities through internationalization and publishing more highly cited research in English. Furthermore, there are universities that have begun full degree EMI programs, for instance a number of curricular courses at Ritsumeikan University (n.d.), including the Global Liberal Arts dual degree program starting in April of 2019 with the Australian National University. The Kansai University (関西大学) Division of International Affairs (国際部) has an EMI curriculum for foreign exchange students, and domestic students in most divisions who have scored well above average on standardized English proficiency tests may also take a limited number of the classes for credit. Foreign students typically stay for a semester or two, and rent university lodging near the main Senriyama campus in Osaka. The Kansai University Global Frontier (KUGF) program includes roughly half classes in Japanese as a Second Language (JSL), with the aim that some will continue as regular students or otherwise be able to handle daily life independently in Japan. Many of the classes also make a connection to Japan, either directly through its culture or by situating subject content such as technology in contemporary Japanese society. KUGF JSL and EMI classes are taught by regular faculty members and contracted professors or lecturers of various nationalities, who typically have academic backgrounds related to Japan. Ikeda & Belarga (2018) reviewed the establishment of KUGF in 2014 as a liberal arts curriculum with a concern for developing competencies in intercultural communication. Since that time the curriculum has expanded into an extensive set of modules in a variety of contemporary fields. They mention added modules in applied science and engineering, social sciences, linguistics, and urban engineering issues, plus a graduate school connection. They frankly detail the ambitious EMI curriculum and international exchanges as partly a response to global competition for higher university rankings (pp. 85-86) [in Japanese, summarized by the author]. According to Ikeda & Belarga, internationalizing the curriculum involves not only English as a medium of instruction but also internationalizing the instructors and cultivating domestic and foreign exchange students as human resources with the competencies needed for a multicultural world. They cite global teacher education, which provides educators with the perspectives and values needed to internationalize the curriculum. Thus in 2015, a year after the KUGF program was launched, global FD was initiated as a form of faculty support and professional development to accompany the EMI curriculum. In the first year this global FD for EMI mainly took the form of a five-day summer seminar on Content and Language Integrated Learning (CLIL) pedagogy (2018, pp. 86-87) [summarized by the author]. Then after two years of the KUGF program with EMI, an International Education Support Office (国際教育支援室) was launched in October of 2016. Workshops on a wider variety of topics related to EMI and CLIL could then be conducted regularly during semesters. In addition to the small-group global FD events gradually expanding to this day, the International Education Support Office also inaugurated individual faculty consultations, which constitute the empirical focus of this paper. The International Education Support Office was inaugurated with the purpose of encouraging faculty members to start English-medium instruction, particularly to design new academic content courses, starting with training to teach and discuss their research in academic English. For one-to-one consultations with faculty members from all departments and campuses, the Office was looking for a professor with high competence in various disciplines as well as in English, according to Professor Keiko Ikeda of the Division of International Affairs who initiated the program. The author, who was already teaching KUGF EMI classes, was selected for the one-to-one consulting role. Since then, with a steady but not numerous stream of clients, the author has turned out to be the sole consultant. In addition, having been requested to submit brief summaries, the author has complete data on the global FD needs indicated by the clients. Now, after more than two years, it may be possible to see patterns in the actual international academic involvements and needs expressed by faculty members, and thus for global FD. Flyers in Japanese inviting faculty members to participate in International Education Support Office programs have been distributed around Kansai University campuses since 2016. See the picture of the relevant part of the first flyer, translated by the author, for details. The flyer introduction, which has not changed substantively from 2016 to 2018, gives examples of needs faculty members may wish to enquire about: to teach in English, to prepare presentations for international conferences abroad, or to raise their English level. They could also find out how to officially set up English medium classes, or to receive training in the teleconferencing system for their students to communicate with partner university classes abroad. The flyer also notes that FD may be conducted remotely by Skype for faculty members at campuses other than the main one where the FD office is located, and such video conferences have actually taken place. Next, it will be possible to compare the needs indicated by the one-to-one session clients from various departments with the goals stated by the Division of International Affairs, considering also the background of societal and institutional pressures for reform. The author has taken the above cues as a duty to encourage each client to negotiate with their departments about teaching regular classes in English. The author has also introduced the Global Frontier curriculum pamphlet to clients in case they might consider teaching those classes combining foreign and domestic students. Some clients are not confident enough about their English or departmental concurrence, while other clients have already started teaching classes in English. One client was welcomed to replace the author in one of his KUGF classes in a field where the client was more specialized, also giving foreign students more exposure to a local professor. From October of 2016 to late November of 2018, the period of this study, summary reports show that N=16 clients visited the International Education Support Office for individual global FD consultations. The number of sessions for each individual varied widely, from one, because of expecting something different or only needing help with an imminent presentation, to many, because they could have more than one course of three sessions. They were full-time faculty members from various departments and campuses of Kansai University, a large private university in Osaka Prefecture. However, the primary data in individual session reports are subject to the limitation of avoiding disclosure of personal information about the clients. While not capturing the fullness of the consultation discussions, and excluding responses to encouragement by the author, the data will be compiled and generally described in terms of types of global FD needs. 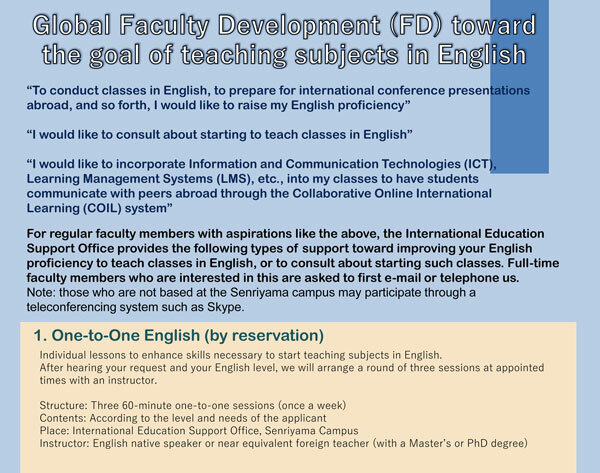 Global FD refers to the support that is inevitably needed when faculty members are involved in teaching or international academic activities in English or another foreign language, activities that are sometimes competitive for the academic accomplishments that reflect well on the university. The level of academic expertise demanded for such support goes far beyond native speaker checking of English. What kinds of global FD needs were expressed by clients? How did the actual needs of clients compare with the support the Division of International Affairs offered to faculty members? Compiling the generic needs expressed by clients may answer research question 1 and give a preliminary idea of the range of international academic activities engaged in by faculty members at a large Japanese university. Generally categorizing expressed needs, it is possible to chart the number of clients requesting each type of feedback or other assistance. Clients could express multiple types of needs, so the total number of needs expressed is larger than the number of clients. The three types of needs suggested in the flyers calling for faculty participation in global FD are listed first in section A below, then unanticipated needs in section B. This allows us to address research question 2 by comparing the needs expressed by clients with the stated goals of the global FD program. As seen in the compiled results, clients basically asked for the services explicitly offered, plus editing of various written genres. An even fuller picture of international educational and research activities by the faculty members could be shown by the more detailed needs they expressed, but which must still be described generally hereinafter to maintain anonymity. Some clients were determined to use their foreign language skills to teach in English and engage in international activities, while others were evidently responding to pressure from their departments. Clients with limited English fluency tended to improve noticeably by the third session, in some cases because their speaking had become rusty. However, improving their English accuracy or fluency tended to be implicit in many sessions that had more specific aims. English could be practiced in other ways, but clients not using English in daily life could benefit from the practice in academic communication. The author generally encouraged clients to consider teaching and presenting in English, for even if their fluency was limited, actually doing it would provide the best practice to become ready to discuss their academic field in English (one of the three goals of the Global FD program). Non-native users commonly have questions about oral or written English, but English is not a single standard language. Therefore, even if their English literacy level was high, clients doing translations or research still had challenging questions about literature written long ago, varieties of English, or regional idioms and cultural references that cannot be found in dictionaries. Advice by the author on presenting at international conferences covered many aspects of both slides and spoken delivery, particularly how to take the focus off the screen and connect with audience members directly. Clients were concerned about unpredictable or incomprehensible audience questions after presentations abroad, culturally different from the quiet respect shown by Japanese listeners. There were a number of unique requests, such as how to moderate a conference colloquium. Clients brought up study abroad programs for their students, taking their Sabbatical abroad, or global educational issues broader than their own specialization. Some were concerned about cultural differences and pedagogical issues in teaching classes of foreign exchange students mixed with regular undergraduates. The writings clients brought to check were varied, including English syllabi for international classes. The English in presentations to check was partly in the PowerPoint slides, or in a script, although reading written English out loud is not a recommended practice. Some needed abstracts checked, to improve the prospects of acceptance for proposals to publish in a journal issue, or to apply to present at an international conference, which are accomplishments sought by many faculty members. In one case, an extremely specialized paper by a client for a prominent journal was receiving many editorial demands for elaboration, but the author could help with revisions, and the paper was finally published. The need for improving academic papers and other writings, not only correcting the English but making papers more publishable, was not listed as a service offered by the Division of International Affairs. The International Education Support Office is cognizant that such a service could be explicitly offered, but it would take some further planning and budgeting, since hundreds of faculty members at the university would probably like to publish their research in English in peer-reviewed journals and other competitive publications. The results indicated that clients from various departments perceived needs for international academic activities, improving their non-native English to the level of academic discussions, and presenting in English at academic conferences. Not as many were both willing and able to start teaching classes in English, as the flyer proposed uppermost. There was as much interest in improving English writings for publications and other academic purposes, despite no mention of it in the flyers. The results can also be seen in a wider context as a response to the international aspirations of the university, but the needs expressed by the clients do genuinely illustrate areas where global FD could be aimed. The Global Frontier (KUGF) program, with foreign exchange students spending at least a semester or two on campus, continues to grow. Regular undergraduates may also enroll in a limited number of KUGF EMI classes if their English proficiency is high enough, and if the credits are recognized by their faculty. As foreign students increase, and the faculties become more globalized, the need for faculty members who can start teaching in English will also increase accordingly, thus the need for global FD. This situation likely applies to other large universities in Japan and elsewhere. In the background of expanding EMI is the increasing seriousness in Japan about English communication for globalization, academic English for the continuing professional development of faculty members, government grants for EMI and other forms of internationalization, and concerns about the relative status of the university --after the amendment of the National University Corporation Act-- centered in the President's Office, which funds the EMI and support programs discussed above. The goal of tripling a thousand foreign students on campus has appeared in the vernacular media, and the somewhat independent faculties are being urged to offer more regular courses taught in English. The institutional culture of large universities in Japan, where change tends to be incremental and sensei is an honorific title, can make it a challenge to establish and sustain such voluntary FD programs, but the faculty participation in growing Global FD programs at Kansai University has been steady so far. The university administration is responding to societal forces of globalization and measures of educational quality affecting the domestic reputation and global rankings of the university. These issues lack forums for discussion but weigh on the minds of academics, as Ikeda & Belarga (2018) indicated. As further details on Kansai University and its comparable peers would go beyond the scope of this paper, for further analysis of how Japanese universities can raise their global rankings, see McCarty (2015). This empirical study has demonstrated some of the faculty development needs of a Japanese university amid the trend to globalization of academic activities. The faculty needs and academic imperatives of other large universities in Japan and other countries where English is a foreign language are liable to be similar. Yet recalling the worldwide and national research cited in the introduction, the distinctive initiatives described in this paper must be considered among the faculty development innovations of recent years. The tendency to insularity of institutions and departments still needs to be overcome in Japan. There are many possible ways to meet global FD needs, but this recognition must lead to necessary reforms in the institutional culture. Interdepartmental coordination and informed concurrence of faculty members could be furthered by offering the kind of services that enhance faculty accomplishments and comparative external evaluations of the university. EMI programs could draw upon findings in the fields of Bilingual Education (see McCarty, 2012, and related articles at Child Research Net) or Content and Language Integrated Learning (CLIL). Doiz, Lasagabaster, & Sierra (2013) suggest immersion bilingual education and CLIL as models for balancing content and language. They conclude that each institution needs to carry out its own research toward a language policy for EMI (pp. 216-219). As much English language training of non-native students and instructors as possible is clearly needed to reach a suitable level for academic English communication. Yet at the same time, there needs to be an accommodation of realities on the ground, where there is a diversity of instructors and students involved, and yet EMI is deemed justified. The development of sufficient English communication skills can only be realized by placing students and instructors in the position where bilingual functioning is a necessity in daily academic life. When universities in a country like Japan operate an EMI program and take in foreign exchange students, some of whose English level is at or near the native level, one viewpoint heard is that the university should prefer to have native English speakers or foreign instructors teaching the content classes. Domestic students who join those classes mixed with foreign students, as in the above-mentioned KUGF program, may indeed prefer foreign teachers in order to improve their English, but that should not be the primary purpose of content courses in specialized fields. To outsource EMI classes would represent a missed opportunity for regular faculty members to develop bilingual and global academic skills as well as for foreign students to directly interact with representatives of the culture they came to discover. A classroom with people from different countries can be a laboratory for intercultural communication, provided lectures are interspersed with discussions and other forms of interaction. Domestic faculty members with limited experience at universities abroad would need to learn about the differing expectations of foreign students, just as they need to deal with active audiences when they make presentations at international conferences. Foreign students took courses at their home universities from subject matter experts, regardless of native language, and may have been encouraged from childhood to exhibit critical thinking and to question authorities. While the majority of exchange students in Japan are from similarly teacher-centered or pedagogically instructivist cultures elsewhere in Asia, many exchange agreements are also sought with Western universities where the pedagogy tends to be more student-centered or constructivist. Global FD therefore needs to go beyond improving foreign language proficiency to practicing expressiveness, intercultural communication, and constructivist pedagogy; from improving PowerPoint slides to engaging directly with audiences; and from a circle of action inside the campus gates to connecting with the global academic sphere. Doiz, A., Lasagabaster, D., & Sierra, J.M. (Eds.). (2013). English-medium instruction at universities: Global challenges. Bristol, UK: Multilingual Matters. Horie, M. (2017). Faculty training for non-native speakers of English at Japanese universities: Effective English-medium teaching for a culturally diversified student population. In A. Bradford & H. Brown (Eds. ), English-medium instruction in Japanese higher education: Policy, challenges and outcomes (pp. 207-223). Bristol, UK: Multilingual Matters. Ikeda, K. & Belarga, O. (2018). Daigaku kyoiku no kokusaika: EMI kamoku kaiko no jujitsu to gurobaru FD no torikumi no tenkai [Internationalization of university education: Establishing substantial EMI courses and a global FD program]. Kansai Daigaku Koto Kyoiku Kenkyu [Kansai University Journal of Higher Education], 9, 85-90. Macaro, E., Curle, S., Pun, J., An, J., & Dearden, J. (2018). A systematic review of English medium instruction in higher education. Language Teaching, 51(1), 36-76. Steve McCarty was born in Boston and specialized in Japan in graduate school at the University of Hawaii. He is an Adjunct Professor for international classes and faculty development at Kansai University. He also lectures for Osaka Jogakuin University, KIC Graduate School of IT, and the government international agency JICA. 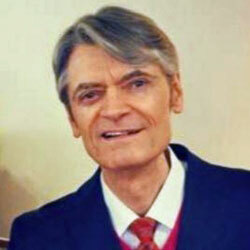 He has served as President of the World Association for Online Education (WAOE) since 1998. He and his Japanese wife have sons in the engineering and entertainment industries in Tokyo. See Steve’s bilingual publications on Japan, e-learning, bilingualism, language teaching, and academic ethics at https://www.portfoliogen.com/waoe.